The season is well underway now and its around this time in the season when suddenly it hits clubs that the green isn’t up to scratch…again! One of the most common problems we hear about from Performance Bowls Greens readers is the difficulty in getting the philosophy to stick at their club. Its all too simple to fall off the wagon and go back to old “traditional” habits. There are of course no silver bullets in Bowling Green Management but for a lot of clubs the call of the “instant fix” magic potion from a bag or bottle soon looks much more attractive than the relentless application of a strict maintenance program that takes time to show results. 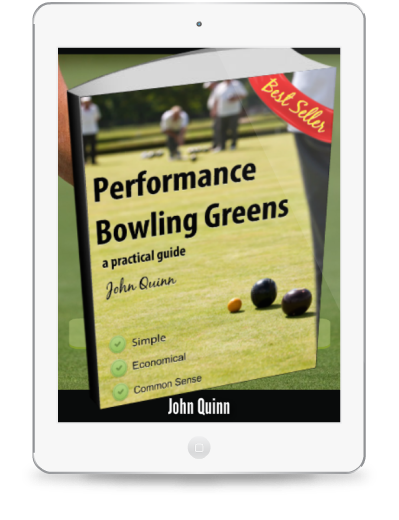 The difference however, is that by applying the Performance Bowling Greens philosophy you ensure that your green improves a little bit every week, and that you work inexorably towards excellence in green surface management. The typical reliance on the quick fix that still dominates the bowling green maintenance world delivers the most disappointing of results, when greens suffer the continuous peaks and troughs of acceptable performance followed by seemingly un-fixable surface disasters. This the sequence of trial and error that sees clubs go through many phases of committee and greenkeeper changes while meantime the green just keeps getting worse. To deliver a Performance Bowling Green you must stick to a plan that makes allowance for the following phases of development. Green Appraisal- Thorough Agronomic and Performance appraisal of green. Baseline Maintenance Plan– to provide a firm foundation before further development. Remedial Maintenance Program– work to correct underlying problems. High Performance Plan– Measures employed to develop green towards performance requirements of club. Such an approach is easily understood by all concerned and simple to communicate to the wider membership. I recently heard of DNA samples being taken from golf green plants have you heard of this before John and how could this benefit greens. This is so far away from where most bowls clubs are that I would try not to be distracted by it. I haven’t read anything about it but I suppose it could be beneficial in selecting stronger or disease/cold/drought/wet/heat/shade resistant strains for seed production. It could be in relation to pesticide production/seed sales. Big Agri business companies have been cornering the seed market by genetically engineering crops that are resistant to glyphosate, allowing farmers to kill off everything but the crop with a cheap spray. This is definitely not where we should be going though. I think it is extreme and no doubt the cost of it would probably out way the benefits especially for bowling greens. Good management and knowing your green would prove just as beneficial.